Let's start Thursday off with a giveaway! 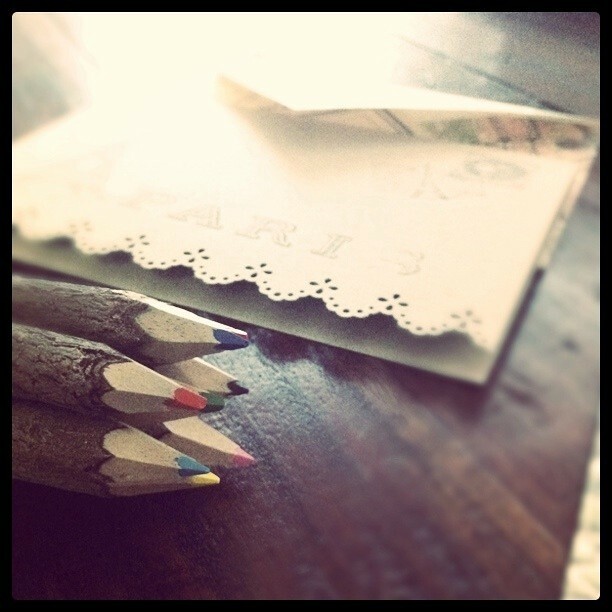 Today I am giving away four pieces of our Paris-inspired stationery. Two a2 cards with homemade map envelopes and (2) 4x9 button and string vintage-inspired letters of love. Just leave a comment! This is a very basic lesson in layers. I'll show you how to create a duplicate of your image in the layers palette so you can always have the original file to come back to. I'm assuming you already know how to open up an image and maybe you've been playing around in photoshop for a few months! Once you understand how layers work, entire worlds will open up to you! No kidding. You can add a watermark to your images, add textures, fix dark circles under eyes, make collages, combine 3 images, etc etc! So let's get started! Three things you should know: I work on a mac , I use cs5 and I love keyboard shortcuts. I'm not sure if the shortcuts are the same on pcs but anyone that does know that (Eric!) please comment! Open one image you'd like to work on in photoshop. Now let's open the layers palette! 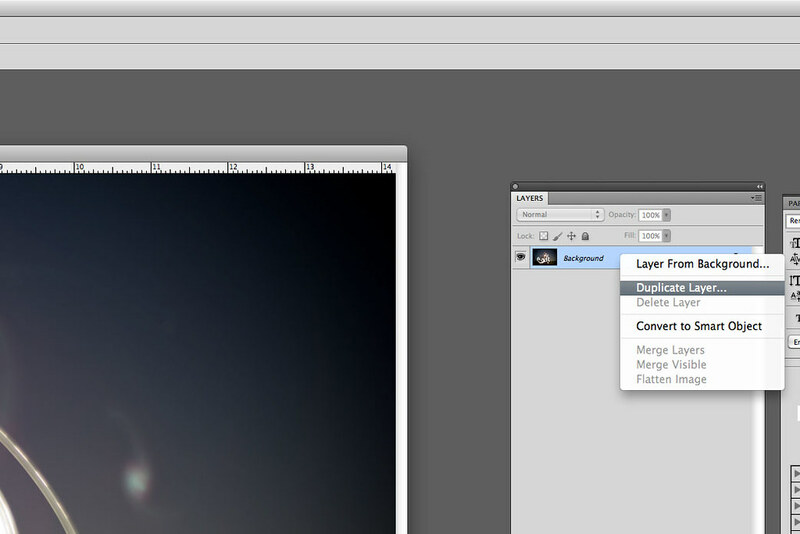 Go to the top tool bar and click on "Window" and then find and click on "Layers". The box that appeared to my right is the Layers palette. It should only say "background." Now we'll create a duplicate copy of our image. 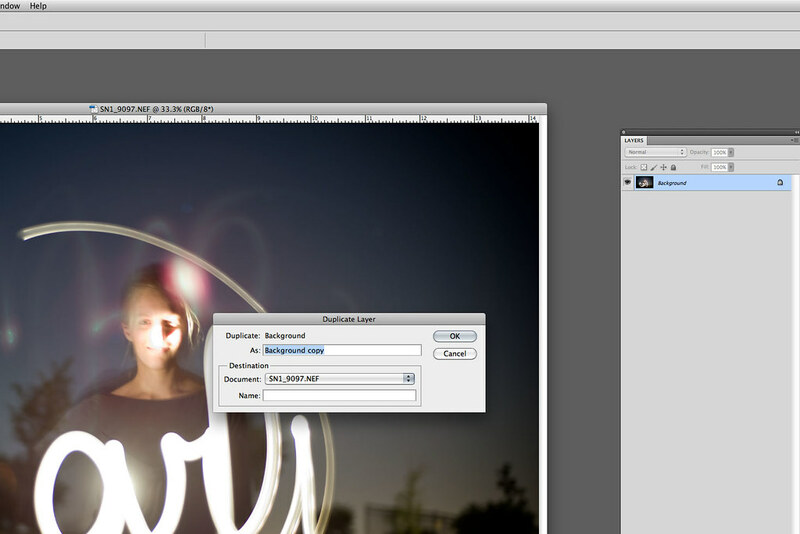 This will allow us to make changes to the duplicate image while leaving the background image alone. 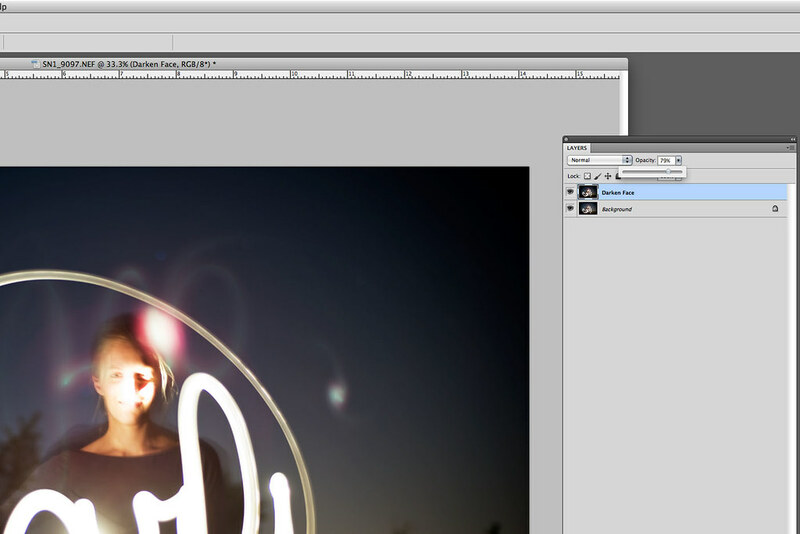 Hold down the control key + click on "background" in the layers palette. A box will pop up. Select "Duplicate Layer". A window will pop up and show the new layer to be created. For now just hit "OK". You'll see in the layers palette "Background Copy". If you get in the habit now of naming your layer specifically what you plan on doing to the image, (ie: lighten background, lighten shadows, liquify, etc) when you get so proficient you have created 10 or 20 layers, you already have them named and can easily reference them! Organization is key here! So let's change the name. Double click on "Background Copy" and type in the revised name! Now that you'll be working with layers, you'll want to consistently have that layers palette open to reference what layer you're working on. If the "Background Copy" layer is selected and highlighted, you're editing that image. If the "Background" image is selected, you're working on the original file. Confirm you're working on the new layer you just created, by making sure it's highlighted in blue. Now make some changes to the image. Darken it, lighten it, whatever you planned on doing. 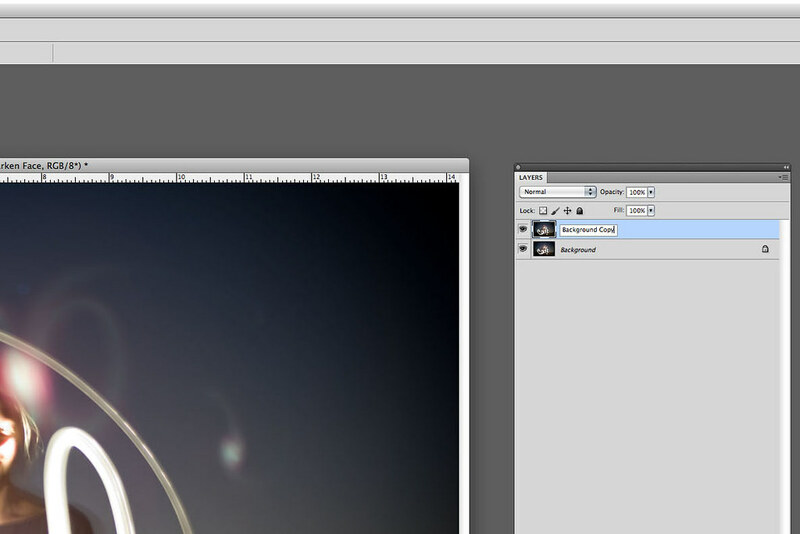 Do you see the little eye icon to the left of the layer name? If you click on that, you'll notice the layer disappears. That's very convenient for referencing how much the image has changed from the original file. Don't forget to click on it again to make the layer reappear! You can only edit layers that you can see. Lastly, you can change the opacity of the image by selecting the small "down arrow" in the top of the layers palette to the right of the word "opacity". Move the slider to the left and right. When it comes to saving layers, you should know that once you save an image as a .jpg even after you've created layers, the .jpg file automatically merges the layers so you will not be able to reopen the image with layers and edit those same layers again. Hold down "command + shift + s" or just go to the file tab and select "Save as". It will default to save as a photoshop file. 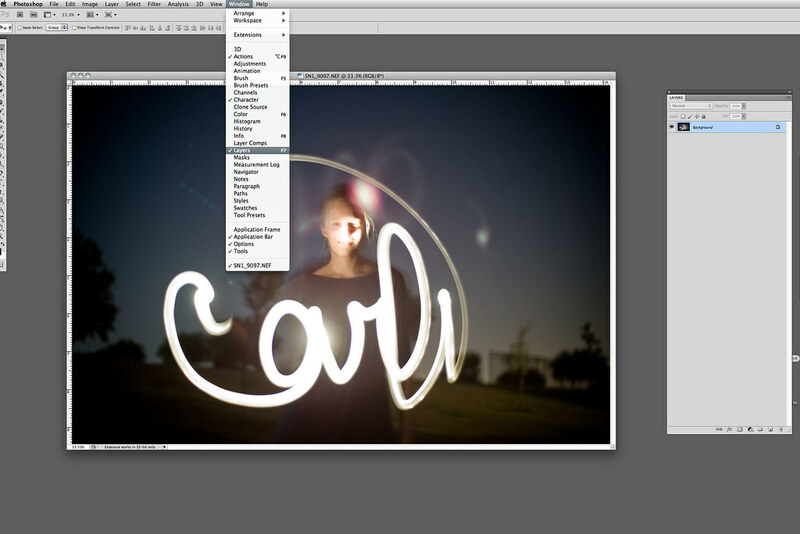 Hold down " command + shift + e " to merge all the layers. Don't forget you can always undo one action in photoshop by "command + z"! That has saved me so many times! Well that's all for today class! Hope this has helped! We'll continue the lesson in layers next week! If you want to know how to do something specifically, leave it in the comments box! love your work... so lovely! Homework has not let me keep up with my fav. blogs, but thank you so much for introducing us with key steps in photoshop!! I so needed this! !